Cobrapost, which was founded in 2003 by Aniruddha Bahal, the co-founder of Tehelka, is a critically acclaimed Indian non-profit news website and television production house, predominantly known for investigative journalism. It has successfully covered several high profile breaks. 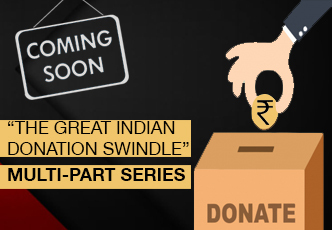 One of its first major breaks was in 2005, when, along with Aaj Tak, Cobrapost conducted an investigation named Operation Duryodhana, which exposed eleven members (MPs) accepting money for putting forward questions in the Parliament. In the aftermath of this investigation, those eleven MPs were expelled from the Parliament, the largest expulsion of MPs in the country’s history. In March 2013, Operation Red Spider revealed that some major Indian banks were involved in money laundering, in Operation Blue Virus, Cobrapost unearthed that some IT firms were using fake identities on social media to help politicians to improve their popularity. On May 2013, we uncovered how banks raise money by soliciting deposits from the general public or using other instruments available to them and use this public money to fund various projects of the corporate or business entities after due diligence. Our investigation titled “Up in the air” revealed how politicians have been using chartered aircraft and some of them even flouting Election Commission norms. One even flew in an aircraft not registered with the DGCA. Several politicians have been flying with family members, government officials and corporate barons, sometimes doing several aerial trips in a single day. Cobrapost also discovered that most of the air charter companies are running into losses worth crores of rupees. On 3 April 2014, Cobrapost published the results of the investigation, Operation Janambhoomi, bringing into light the conspiracy behind the demolition of the Babri Masjid, in December 1992, rewriting the history of modern India on communal lines. Our latest investigation, Operation Juliet, busted the bogey of Love Jihad in India. Serious anomalies came to our notice in the case of three cooperative societies, one for judges and two for journalists and we found that the Madhya Pradesh government led by the Chief Minister Shivraj Singh Chouhan had allotted land to the powerful and the high and mighty people, with the sole aim of gratifying them The total loss in revenue accrues to Rs 95 crores in land allotments. Interestingly, on the land allotted to the judges in 2007, a legal battle is on about its ownership in the MP High Court and a title suit is pending since 2002. Several laws were flouted by the MP government to give a four time discount on the actual land price which we put forward in our report “Law of the land: How Madhya Pradesh Government largesse benefitted Vyapam SIT chief, Judges and journalists. From politics to corporate corruption, social issues to banking scams, Cobrapost has covered myriads of arenas with their groundbreaking strategies and sophisticated news sense to bring its audience the truth. Although it is steeped in investigative journalism, Cobrapost also covers news from all over India, current headlines and hot topics, latest news on business, sports, international events and entertainment. Our North India office is based out of the NCR and we have launched a revamped website to include mainstream news into our oeuvre. Cobrapost relentlessly works towards social causes, courageous journalism and freedom of expression, encouraging young talents in the industry and provides a platform for dissenting voices to emerge out of the clamour of the mainstream media circus.